Japanese art? No, this is a photo taken by David Lucal, one of the winners of our Photo Contest. Well Reader, wouldn’t Richard Louv be thrilled to visit our Hall’s Pond Nature Sanctuary in densely populated Coolidge Corner, the bustling core of Brookline’s main shopping area, adjacent to two stops on the Green Line, next to four-season active recreation at Amory Park. He, and all other visitors will find a sanctuary, a wildlife refuge, a place for quiet contemplation, a place preserved forever by the Town of Brookline Conservation Commission and the members of The Friends of Hall’s Pond. Our goal remains what it has been since our founding 36 years ago: to use this unique space gently; our mission is preservation, our mandate is protection and enhancement of this urban resource and our task is collaborative education for stewardship of these 3½ acres of pond, wetlands, uplands and formal garden for now and for posterity. We invite, indeed we encourage and cajole you, to join us in our endeavors. 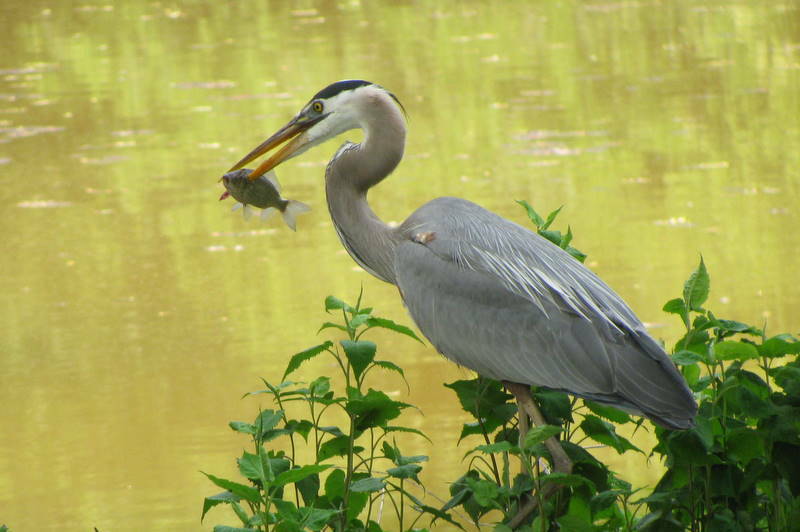 We hope that you are already Friends of Hall’s Pond members and four-season visitors to Hall’s Pond, and if you are, we urge you to join one of our committees and become more deeply involved in the life of the sanctuary. If you are not now a visitor and a member, we hope that you will become one. We seek your involvement and your investment to allow us to serve as effective stewards for the sanctuary as partners to the Town. You will note the donor solicitation envelope in this newsletter which now replaces our traditional year end snail-mail request for contributions. We are saving trees and money spent on stamps and are instead, dedicating those monies to new plantings in the sanctuary. We believe that this is a responsible decision and we sincerely hope that you will agree and use the enclosed envelope to send funds for which we will be grateful. Come and visit the sanctuary and see how your donations are put to work. Dusk, like the sharp breeze, curls through the vista of yellow willows lining the Pond. As the pink-orange glow dims, a thickening hush muffles in, with a Cardinal’s tink! in a thicket, a dog’s bark, the C Line’s whine. Pond life as observed a decade ago doesn’t change much, winter to winter. Old Great Blue, the heron who’s our Pond’s herald, immortalized in Roethke’s lines above, is probably last summer’s bird. He’ll last ‘til the deep freeze nudges him reluctantly on, perhaps to return with ice melt come March. He may make it to coastal Connecticut, Long Island, or Delmarva, and slouch under wetter snows and less stormy slings through the coldest of it. 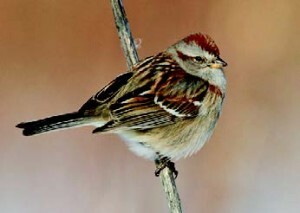 Listen for a mixed flock of Sparrows: Songs chit! 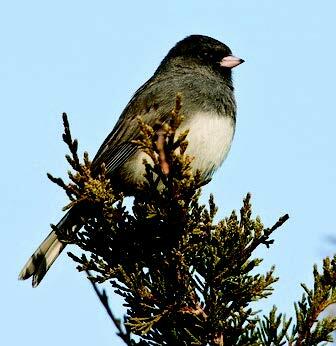 in the rustling cattails; Tree Sparrows, Whitethroats, heard by that hiss, slip through the formal garden’s furled rhododendrons; if you’re lucky, a few fat, ruddy Fox in the upland behind the stucco garage along Ivy St. (Sometimes a merry troop of Juncos trill and flit their white-edged black tails there.) There’s often a herd of ‘chirruping’ House (not ‘real’ sparrows, but weaver finches) holding caucus by the tennis court gate. 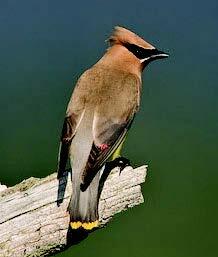 Clucking indignantly, Robins stake out the last of the winterberry and holly, though near-silent, high-trilling masked marauders – sinuous, sleek Cedar Waxwings – may eventually beat their time. A lone Mockingbird may fend off the jays or a late towhee or catbird from his stash of red holly behind the formal garden’s bench. Squirrels, having cracked and stowed the last of the oak-nuts, forage through the rusty chaff under the Japanese maple and slip through the swooning asters. 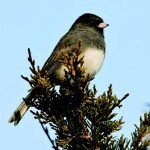 Curious Chickadees approach close and zeee, and Titmice twitter-twit, flashing their grey crests and miniature pop-eyes. In the deepening indigo, crows sail, ominous black stealthy angled shapes, over the pines, towards their evening roost. Polyglot Blue Jays softly cah cah cah like titmice, raspily schkree like Red-tailed Hawks (like the good mimics they are) or do their alarmed toottoot between friends. Trod the creaking or crackling (if icy) boardwalk, through leaves of rusty oak, ruddy maple, with the bare apple and black cherry. 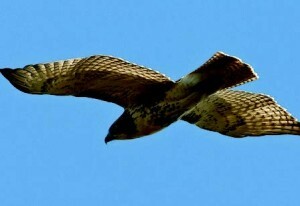 You might sudden upon a Merlin bathing in an icy vernal pool, or be surprised by his darting through the trees. He flies up, shakes and composes himself on a branch, leisurely fluffing to dry on one yellow foot. Towards March, the air stays cold, but the sun grows warm; daffodils perk up, raising yellow flowers, poking out green shoots. White snowdrop and bluebell persevere. A crow dines on remnants of squirrel from the podium of a high oak stump near the boardwalk: is that leftovers from a Red-tail’s or Merlin’s breakfast? He grabs his grisly beakful and moves silently off. Late March reminder: check the gnarly oaks along Amory St. for subtle signs of Sapsuckers. Get out and stretch in the taut gray mornings with the birds and trees, ye Brookliners! 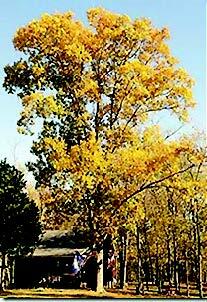 An example of what our new Pignut Hickory may look like when it matures in a few years. With your help and generous contributions, The Friends of Hall’s Pond and the Town of Brookline have begun replanting some of the trees lost due to storms in 2010 and 2011. Early this fall, two new large Hickory (Carya glabra) were installed in the sanctuary along with a number of Horse-chestnut (Aesculus). While still young, these native hickory trees have a smooth grey bark and tapered trunk. As they age, they will develop small, astringent nuts, and the bark will begin forming diamond patterned ridges. 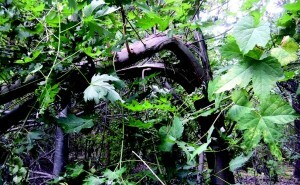 It can become quite a tall tree (60′), have a somewhat narrow crown, yet still be an important part of the tree canopy. It is well known for its terrific golden yellow fall color. In Donald Wymans’ book “Trees for American Gardens” he says that a well-placed specimen can be just as beautiful as an American Elm. While the nuts have little economic value, the tree itself has some importance. 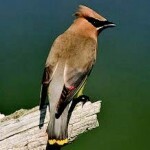 It is an important timber tree known for its hard wood and therefore good for fuel and tool handles and will provide some value to songbirds and small mammals. Another fascinating fact is that along with strong tool handles, hickory was the original type of wood used for baseball bats! Watch next spring as we continue to replace plants that were lost and damaged in the sanctuary. The Board members of The Friends of Hall’s Pond thank you and asks for your continued support of our horticultural fund. 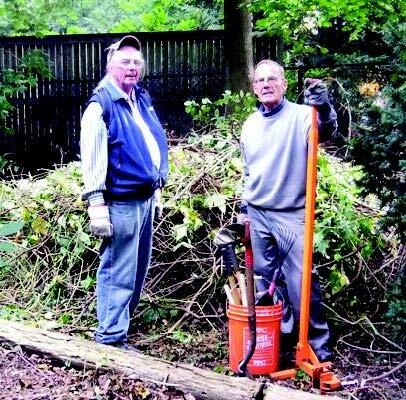 Bruce Wolff and Frank Caro by a mound of invasive vines, mostly Porcelainberries and Asian Bittersweet, pulled from one small section of the Sanctuary. We are seeking additional volunteers for a team that is active from spring through fall in maintaining Hall’s Pond. Working in small groups, we do a wide range of chores in the formal garden. In the Sanctuary we carefully remove selected invasive species. In the 2012 season, we plan to be active every week or two for two hour work sessions. All the work we do is consistent with the overall maintenance plan for the Sanctuary. The timing of the work sessions will depend on the availability of our volunteers. We are particularly eager to attract volunteers who will be part of our team on a regular basis. No experience is necessary. We will provide training and equipment. 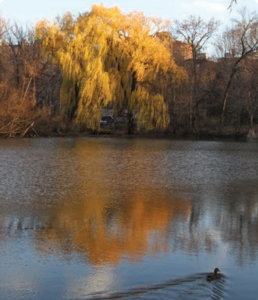 The main benefit is an increased appreciation of Hall’s Pond. Volunteers will also learn sound garden maintenance strategies. They will also learn how to identify invasive species and to remove them effectively. We will build on the success of our efforts in 2011. Thanks to abundant rain, moderate temperatures, and our persistent efforts, the formal garden was attractive throughout the gardening season. We also had some success in keeping the invasive species under control. For more information, contact Frank Caro at frank.g.caro@gmail.com or 617-739-9228. Francis (Frank) Caro, PhD is a Professor Emeritus of Gerontology at the University of Massachusetts Boston. He is a former director of the University of Massachusetts Gerontology Institute where he remains active as a fellow. He is the editor of The Journal of Aging & Social Policy, an academic journal with an international audience. His current research interests include Productive Aging and strategies that older people can use to maximize their independence. He is a Sociologist by training with a PhD from the University of Minnesota. 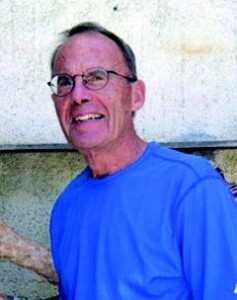 He has also held academic positions at Marquette University, University of Colorado, and Brandeis University. In addition, he served as the research director at the Community Service Society of New York. Frank lives in Brookline where he is Co-Chair of the Steering Committee of the Brookline Community Aging Network (Brookline-CAN). Brookline-CAN calls attention to features that make Brookline attractive for older people. Brookline-CAN supports members in their efforts to live successfully in Brookline and to contribute to civic life. He has been a Town Meeting Member for 9 years and a member of the Town’s Advisory Committee for 8 years. Currently, Frank is a board member of The Friends of Hall’s Pond where he is a leader of a volunteer group of gardeners. For a few seasons he and his group of volunteers have been taking care of the regular maintenance of the formal garden. He has also been a leader in the implementation of the work plan for the sanctuary. This is a permitted activity within the sanctuary that carefully works within the confines of the work plan approved by the conservation commission on the maintenance, management, and stewardship of areas within the Hall’s Pond Sanctuary. Porcelainberry (Ampelopsis brevipedunculata) is nice to look at but naughty indeed. 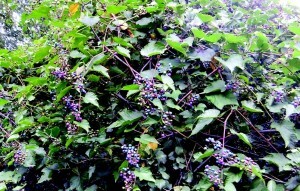 Highly invasive, it strangles trees and competes with native fruit-producing plants. 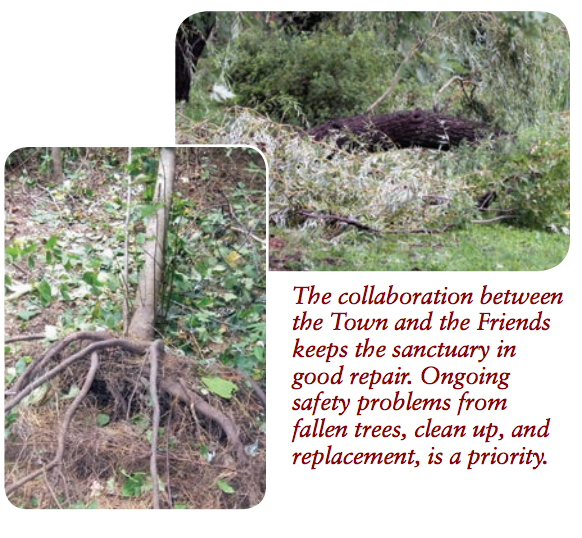 Such invasive species, as well as broken and downed trees from storms, require constant attention and regular maintenance in the Sanctuary. 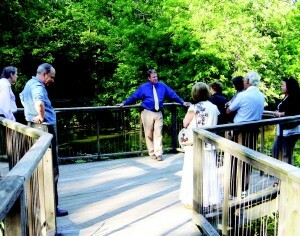 Tom Brady, Town Conservation Administartor, Tree Warden, and Town Arborist, leads Friends members on a tour of the sanctuary before the 2011 Annual Meeting last June. Continued support and ongoing information on progress and management is critical to the continued stewardship and management of the sanctuary.